DEAR JAY INSLEE: DON'T RUN FOR PRESIDENT » how's your morale? Jay Inslee is the governor of Washington now, and maybe he will try to become the Democratic nominee for president. I hope he does not, because Inslee a generically handsome, do-nothing politician that people regard with indifference and then forget. Inslee does not do all that much, but he seems like a nice enough guy on TV. That fundamental adequacy means he is a perfect member of the U.S. House of Representatives and a mediocre governor. He doesn’t actively hurt anything, but he doesn’t actively help anything. Inslee’s first term as governor of Washington was a nothingburger. That is unremarkable, because Olympia doesn’t do much of much. Inslee’s predecessor, Christine Gregoire, didn’t do stuff either. Gregoire’s chronic inaction is one drop in a larger ocean of inaction over the course of decades that gave Washington the most unfair tax code in the country, and criminally underfunded public schools. I don’t mean criminally as a metaphor. Literally, judges said the state government was committing a crime. We still had the criminally underfunded schools and the unfair taxes after Inslee’s first term. This year, the legislature fixed part of the problem. (Sort of.) The schools aren’t criminally underfunded any more, but they are definitely still crappy and underfunded. Also, we still have the bad taxes. Inslee signed the bill that solved the criminal underfunding, but really it was people in the Legislature who finally figured out the solution after six years of procrastinating. Also, the bill didn’t really solve the problem. Also, Jay Inslee’s big thing is stopping climate change, which is nice. Jay Inslee has not done anything about climate change as governor. Inslee has been governor for almost six years, and in the last legislative session had majorities from his own party. Despite that, he has not gotten carbon pricing legislation to pass either chamber of the legislature for his entire tenure. Neat! Also, Inslee was governor when the state decided not to pay any money for light rail expansion in Seattle—aka the only big infrastructure project going right now that could reduce the state’s carbon footprint. 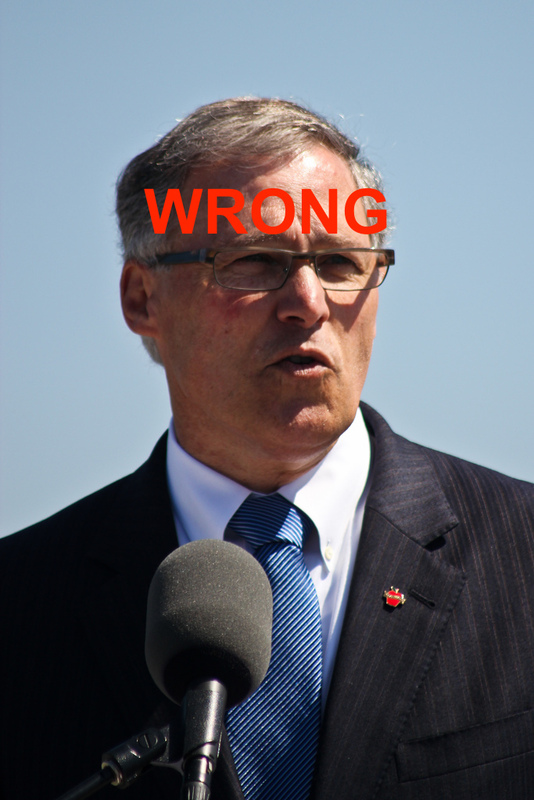 So, anyway, Jay Inslee isn’t that good at being governor. I mean, he could be worse, I guess. So I hope he does not run for president, because he would probably not be very good at that either. Next WILL THE NEXT SEAHAWKS OWNER BE AS GOOD AS PAUL ALLEN?